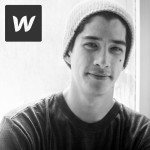 William Wong is a web designer, who was born and raised in Las Vegas. He has been living in DTLV since 2009. Wong currently leads Customer Happiness (which he dubs “Happiness Guy”) for Webflow. His main focus in life is to help build and nurture sustainable communities. “Webflow is a visual programming environment that allows you to design production ready sites without writing any code,” he explained. It’s a web design tool, CMS, and hosting platform in one. Recently, Wong launched the Webflow Web Design Meetup, but is quick to note this Meetup is not a Webflow product seminar, a transgression he says he sees all too often. Wong says he has always enjoyed teaching and helping others reach their goals. “A common tenet I live by is ‘If I help enough people get to where they want to go, I will be where I want to be.’ This Meetup will help beginner web designers gain a better understanding of the web and will help seasoned web designers expand their toolkit to develop projects faster,” he said. Wong has been an ongoing member of Work In Progress and says he believes there isn’t a better place to host educational Meetups. This meetup is for those who love designing, but hate coding. The Webflow Design Meetup is for anyone currently using or interested in learning about building custom websites using Webflow. Attendees don’t have to have any experience to join, just an interest in visual programming/design. These weekly Meetups go over “Webflow how-to” as well as provide a place where all web designers can meet to refine and share new skills. The Meetup group is currently in a 6-week series all about rebuilding the Zappos.com homepage. Wong says this educational course is something he fully supports on his won personally, and he does not transfer expenses onto Webflow. “Any help, sponsorships, or support from the #VegasTech community is super duper 100% appreciated,” he said. Keep up with what’s coming up at the Webflow Web Design Meetup by checking out their Meetup page. Get to know other #VegasTech community members here!